Iran's defence minister has confirmed that it tested a missile over the weekend, but denied it had violated a UN Security Council resolution. Hossein Dehghan said the test was "in line with our plans" and insisted that the country would "not allow foreigners to interfere in our defence affairs". The US warned on Tuesday that the test, reportedly of a medium-range ballistic missile, was "absolutely unacceptable". Iran has carried out several since a 2015 nuclear deal with world powers. A 2010 Security Council resolution, which barred Iran from undertaking any work on "ballistic missiles capable of delivering nuclear warheads", was terminated after the nuclear deal was implemented a year ago. It was replaced by a new resolution, 2231, which "calls upon" Iran not to "undertake any activity related to ballistic missiles designed to be capable of delivering nuclear weapons, including launches using such ballistic missile technology". 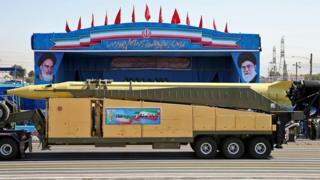 Iran says its nuclear programme is entirely peaceful and that it will continue missile development. Mr Dehghan did not say what type of missile was tested, but he stressed it was not a breach of the nuclear deal nor resolution 2231. Iran only produced weapons to defend its "goals and national interests", he added. His comments came after the UN Security Council held a special session to discuss the issue. US permanent representative Nikki Haley said Iran was believed to have tested a ballistic missile capable of carrying a 500kg (1,100lb) payload and with a range of more than 300km (187 miles). "That is more than enough to be able to deliver a nuclear weapon," she added. Ms Haley said that was something the world "should be alarmed about". "The United States is not naive," she added. "We are not going to stand by. You will see us call them out as we said we would and you are also going to see us act accordingly." The Security Council's member states requested a report on the test from UN Secretary General Antonio Guterres and a UN committee. Israeli Prime Minister Benjamin Netanyahu had earlier said that "Iranian aggression must not go unanswered" and that he would discuss renewing sanctions on Iran when he met US President Donald Trump in Washington later this month. Both men were fierce critics of the nuclear accord.